If you’re on the hunt for a hatchback that does more than get you from point A to point B, then you’re in the right place! The 2018 Volkswagen Golf GTI goes above and beyond the call of duty by combining impressive performance with a smart, tech-savvy interior. 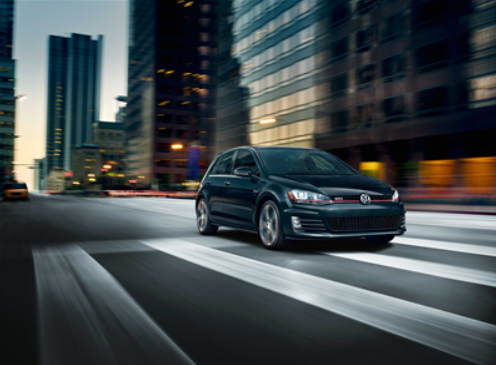 To introduce hatchback shoppers in Toms River, Brick, and Freehold to just some of what the VW Golf GTI has to offer, we at Toms River VW have put together this detailed review. Read below to see what you can expect when you get behind the wheel of the VW Golf GTI! The 2018 Volkswagen Golf GTI is run by a high-powered turbo direct injection 2.0L 4-cylinder TSI engine. This engine gives you the best of both worlds with an impressive power output of 220 horsepower and 258 lb-ft of torque when filled up with premium fuel. You’ll also achieve an efficient EPA-estimated 33 highway/25 city MPG1. This engine comes standardly paired with a 6-speed manual transmission and a front-wheel drivetrain. Another helpful, standard feature you’ll get under the hood is the Driver Mode Selector. To perfectly customize your performance to your current driving conditions, choose one of five unique driving modes including Eco, Comfort, Normal, Sport, and Custom. In addition to being powerful and efficient, the 2018 Volkswagen Golf GTI is smart with its many standard and available advanced technology features. In the base trim, you’ll have a 6.5-inch Composition Color touchscreen display accompanied by a sound system, rearview camera system, Bluetooth® audio streaming capabilities, and Volkswagen Car-Net® App-Connect. The latter feature standardly bundles Apple CarPlay™, Android Auto™, and MirrorLink® to give you easy access to your smartphone. These features take “staying in the loop” to the next level, by giving you access to all your favorite smartphone apps right on your vehicle’s infotainment display. The VW Golf GTI doesn’t stop there, though. You can upgrade to the available “Discover Media” touchscreen navigation system. This system gives you everything that the base level system does, but adds an 8-inch glass color display, voice control, and turn-by-turn navigation. Yet another category that the 2018 Volkswagen Golf GTI excels in is safety. As a recipient of the NHTSA 5-Star Overall Safety Rating2, you know that this model is packed with safety features, starting with standard features like seven stability-enhancing systems, a Tire Pressure Monitoring System, an Automatic Post-Collision Braking System, and an Intelligent Crash Response System. Up the safety of your VW Golf GTI even more with its various available driver-assistive safety features. Features like Blind Spot Monitoring and Rear Cross-Traffic Alert watch your blind spots, while Lane Keeping Assist and Front Assist monitor your surroundings to ensure you’re a safe distance from the vehicles around you. Explore the VW Golf GTI Today! Now that you’ve had a taste of the capabilities in the 2018 Volkswagen Golf GTI, it’s time to get behind the wheel and experience the whole package for yourself. Shoppers in Toms River, Brick, and Freehold should contact our team at Toms River VW today to schedule a test drive! 125 city/33 highway MPG (2018 VW Golf GTI 2.0L, 6-speed manual transmission). EPA-estimated. Your mileage will vary and depends on several factors, including your driving habits and vehicle condition.